At 1 p.m. eastern, people across the country walked out in solidarity with Christine Blasey Ford and Deborah Ramirez. The hashtag #BelieveSurvivors was used by politicians, actors, students, and regular people to capture the scene and hold together a network of protests in support of these two women and in solidarity with all survivors. Some walked out of their schools and offices alone. Others were arrested in the halls of the United States Senate offices. Many were unable to leave work, but wore black in solidarity. There were countless ways to protest, and this is some of what it looked like. 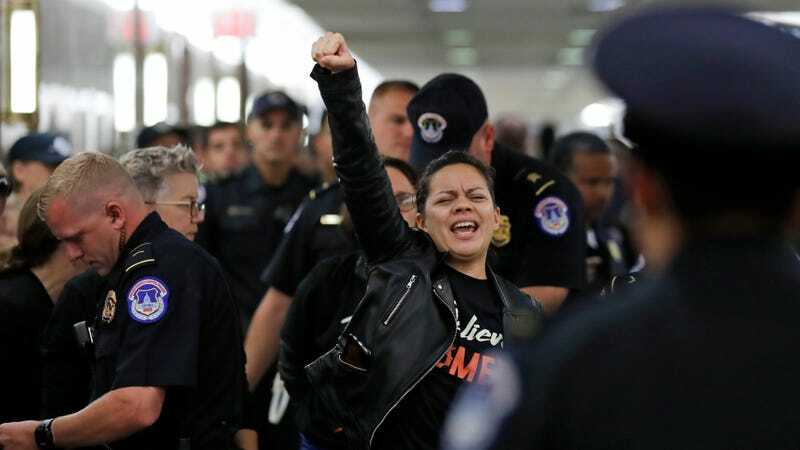 Protestors were arrested in the rotunda of the Russell Senate office building in Washington, DC. Hundreds of Harvard Law School students walked out en masse. A woman told the heartbreaking story of her own sexual assault in the Russell Senate Building in Washington, DC. New York City was full of protestors wearing black. Anita Hill loomed large in the protests. Several organizations came together in Dupont Circle in Washington, DC for the walkout. Protestors at the offices of Ohio Senator Rob Portman, who worked with Kavanaugh during the Bush years. And a reminder that a walkout like this shouldn’t have to happen in the first place.